Researchers from India have demonstrated – for the first time – magnetic, helical-shaped nanomotors inside a living cell. These tiny devices could be used to deliver therapeutic payloads to highly specific locations within the cell. Credit: Malay Pal, et al. / Centre for Nano Science and Engineering, Indian Institute of Science, Bangalore. Nanobiology is a field of growing significance, due to the tremendous potential of nano-sized machines to carry out tasks directly inside living systems. Applications such as the detection and treatment of cancer, targeted drug delivery, microsurgery for a range of conditions, and environmental remediation have put nanomachines in the spotlight during recent years. Taking inspiration from Richard Feynman and Fantastic Voyage, a team from the Indian Institute of Science, Bangalore, has demonstrated the controlled manoeuvrability of nanomotors in living cells. Led by Prof. Ambarish Ghosh at the Centre for Nano Science and Engineering, their research appears in the prestigious journal, Advanced Materials. As their name implies, nanomotors are extremely small devices. They can be maneuvered by remotely powering them using various sources, such as magnetic, acoustic or optical fields. A biological cell, the building block of life, is made up of a dense fluid, called the cytoplasm. Tiny structures known as cellular organelles, along with the cytoskeletal network and a host of biomolecules, make the cytoplasm a very crowded environment. A small machine voyaging through such a milieu in itself is a fantastic concept. The precise motion of nanomotors inside a human cell opens up exciting opportunities for biological applications. Delivery of cargos to intracellular locations, diagnosis by sensing molecules, and probing of the intracellular environment are just some of the interesting functions that a nanomotor can perform. 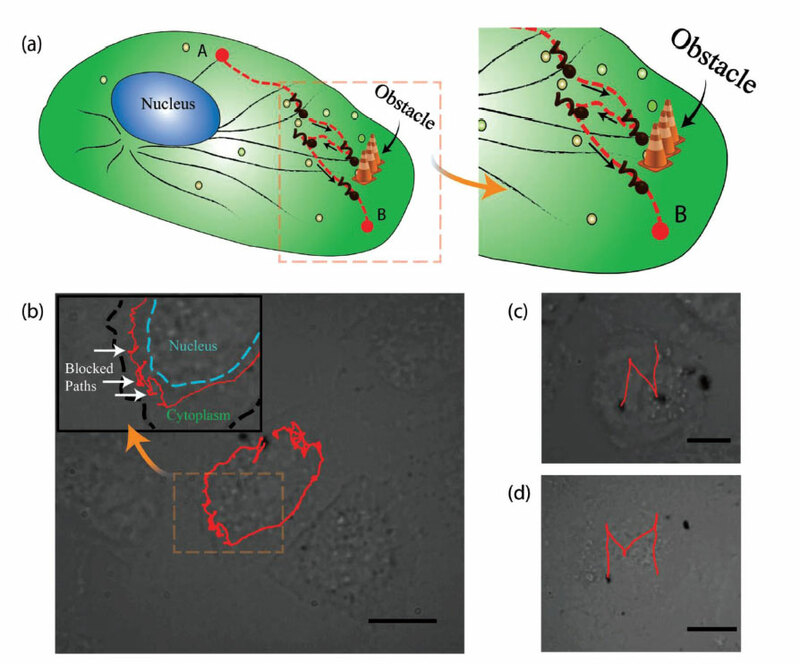 The controlled motion of an external probe in a living cell can offer researchers the ability to target specific organelles. The cell can be internally probed, at precise locations, to map the physical properties. In this study, the researchers fabricated helical nanomotors of two sizes: 2.8µ long and 400 nm wide; and 2.4µ long and 250 nm wide, using a technique called glancing angle deposition (GLAD). These devices, made of magnetic materials, were absorbed by the cells after incubating them together for a day in a petri dish. Fluorescently labelled HeLa cells (a cervical cancer cell line) were then imaged with a confocal microscope and a 3D reconstruction of the cell was made. On entering the cell cytoplasm, the nanomotors encountered a highly complex, heterogenous environment. 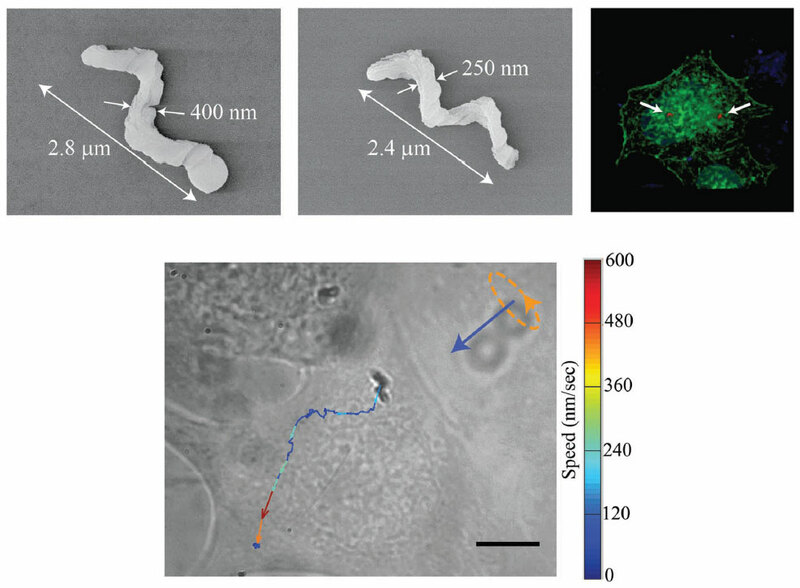 A rotating magnetic field was generated from an optical microscope, driving the motors inside the cytoplasm. This type of magnetic field is widely used in biomedical imaging techniques, such as MRI, and known to be completely benign to living systems. By applying the magnetic fields at such high precision, the motors were able to undergo rotation and net translation inside the cell. The motion and speed of the motors varied in different regions of the cell, due to the highly dynamic nature of the cytoplasm. The heavily crowded cellular environment would sometimes cause jamming effects in the path of each motor. 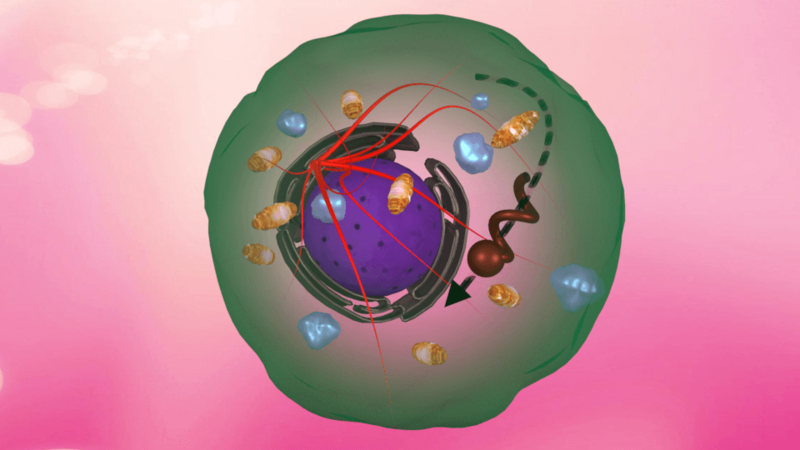 Due to the complexity of the cell interior, the nanomotors often had to be detoured from their path, such as going around the intracellular roadblocks. Nevertheless, exquisite control in manoeuvrability was achieved by the smaller of the two motors (250 nm), as they were driven in trajectories to depict the letters "N" and "M" to represent the word "NanoMotor" (pictured below). "We have demonstrated – for the first time – internalisation and subsequent manipulation of helical-shaped, magnetic nanorobots, called nanomotors, inside a living cell," research student Malay Pal told FutureTimeline.net. "This has a tremendous potential in delivering payloads to specific locations within the cell, which has not been possible until now. We believe that this work could open up new biomedical applications like intracellular sensing and delivery, and also inspire fundamental studies in cell biology and biophysics." In the past, nanomotors have been moved inside cells driven by acoustic fields. However, acoustic fields can detach cells from the substrate and may even cause stress to the cell. In this respect, the magnetically-driven nanomotors studied here provide a crucial advantage. They can be internalised in cells and manipulated in attached cells as well as a suspended state. The health of the cell was determined by using fluorescent dyes and the cells stayed viable throughout the entire duration of these experiments. Helical propulsion is more efficient than using gradient fields and the dynamics of helical motors are already well understood. Another important aspect of this study is that the nanomotors sensed fluid viscosity without any further modification or chemical functionalisation. This is a huge advantage as it is now possible to couple other smart features to nano-scale devices. In conclusion, the researchers say, their nanobot designs hold great promise for future therapeutics. They have all the potential for targeted drug delivery, nano-sensing and possibly an alternative to conventional cancer treatment. However, these results are still in the laboratory and need further research to be taken to a clinical environment. Prof. Ghosh's lab and a few other groups, spread around the globe, are now working to make this possible.